This question has bothered scientists for millennia. There are now two main theory classes: Modern programmed aging theories say that we are purposely designed to age because limiting individual lifespan produces an evolutionary advantage for a species population. Older non-programmed aging theories say we age because living longer did not produce a net evolutionary advantage and therefore organisms never evolved better ways to deal with natural deteriorative processes. These "evolutionary" theories are based on different modifications to details of Darwin's survival-of-the-fittest concept. Both theories explain why different mammal species have such different lifespans but they differ greatly in their predictions as to the nature of biological aging mechanisms and consequently the best ways to attempt to treat or prevent age-related diseases and conditions. Although for decades programmed aging in humans was thought to be impossible and medical researchers therefore followed non-programmed theories, new theories and experimental discoveries favor programmed aging. This exciting development offers the possibility of finding radically new ways to prevent and treat diseases caused primarily by aging such as cancer, Alzheimer's disease, heart disease, and stroke. This site is intended to provide information and resources describing these developments. New: Programmed aging theories: Aging is a treatable condition 2018 Article describes why modern programmed aging theories support the idea that human aging is itself a medically treatable condition. Programmed Aging and the Intelligent Design Effect 2015 Why programmed aging seems "nuts" but is actually the best science. 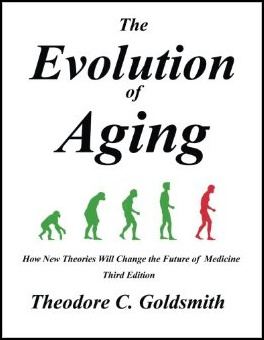 The book, The Evolution of Aging 3rd Edition (PDF) Revised 4/2014 is available here for free download. The book covers various theories of aging, summaries of evolution theories, the impact of evolution theory on aging theories, effect of theories and attitudes on anti-aging research, and summaries of many scientific observations that influence thinking on the subject of aging. The book argues that programmed aging is the correct theory "beyond a reasonable doubt." The book is also available as a paperback ISBN 9780978870959, 8.5 X 11 format, 190 pages, 29 illustrations 4/2014. Free e-book versions are also available from Amazon Kindle and Apple iBooks. Biological Aging Theories Summary (Short slide presentation - PDF - updated 8/2015) also see Narrated Video Lecture version. Aging Theories and the Zero-Sum Game 2/2014 Guest editorial on the importance of resolving the programmed/ non-programmed aging controversy. Arguments Against Non-Programmed Aging Theories 5/2013 Article describing major problems with non-programmed aging theories including failure to match many observations and serial implausible assumptions. New Evolution Concepts Are Changing The Way We Think About Biological Aging 9/2013 Overview of the current aging-theory situation written for a wide audience. Programmed vs. Non-Programmed Aging -- Tom Kirkwood, author of a 1975 non-programmed aging theory, still thinks aging is non-programmed. This is a formal reply (2012) to his recent article On the Programmed/Non-Programmed Nature of Ageing within the Life History, 2011. In effect, Kirkwood and other non-programmed advocates no longer argue against specific programmed aging theories or against their underlying evolutionary mechanics theories! New Truth to the Fountain of Youth: The Emerging Reality of Anti-Aging Medicine (PDF) (Free Kindle ebook) (Free Apple iBook) (Free Nook ebook) -- 2012 - Short free ebook describes aging theories, evidence, issues, and approaches to finding anti-aging agents. Rationale for Programmed Life Span Regulation in Mammals -- Invited paper presented at the Homo Sapiens Liberatus Workshop, May 2010, Moscow State University. Programmed Aging Info -- Site provides extensive educational material and discussion of aging theories with emphasis on programmed aging. Evolutionary Mechanics Controversies and the Theory of Aging (HTML) (PDF) -- A 150-year-old disagreement is still inhibiting medical research! The Case for Programmed Mammal Aging -- Journal article describing experimental evidence and evolutionary basis favoring the idea that aging in humans and other mammals is the purposeful result of their genetically programmed design. Journal Article: Aging, Evolvability, and the Individual Benefit Requirement; Medical Implications of Aging Theory Controversies Journal of Theoretical Biology. Discusses evolvability as an adjustment to classical evolutionary mechanics theory and describes an evolvability-based theory of aging. See results of our Poll on Attitudes About Aging. Journal Article: Mammal Aging: Active and Passive Mechanisms Compares the passive "maintenance and repair" theory of aging with an active life span management theory for aging in humans and other mammals. Discusses evolutionary basis of each theory as well as their implications regarding future treatments for age-related conditions and diseases. The journal article, Aging as an Evolved Characteristic - Weismann's Theory Reconsidered provides additional information on adaptive theories of aging. Journal Correspondence: Evolvability and Programmed Aging: A Response to de Grey. Discusses impact of theories on medical research. The aging resources page provides links to sites having information on traditional theories, adaptive theories, relevant discoveries and other subjects mentioned in the book. The Biological Clock Theory is a type of programmed aging theory. Darwin's theory, published in 1859, explained many things about our natural world. Although there is essentially universal scientific agreement that evolution did occur there is growing scientific disagreement regarding details of evolution mechanisms and processes. This disagreement results from observation of organism characteristics that appear to conflict with traditional "survival of the fittest" evolutionary concepts and discovery of apparent logical issues with those concepts. Evolution Update provides a current overview of the evolution situation including discussions current scientific issues with evolution process theory, and more. Life span is one of the few observed characteristics of organisms that conflicted with Darwin's theory. Evolution theory is therefore very central to theories of aging. One of the issues that has appeared involves the digital nature of the genetic code. The overview in Digital Genetics and the Theory of Evolution discusses the disagreements and proposed adjustments that primarily affect aging theory. Summary of Evolvability Theory of Aging.